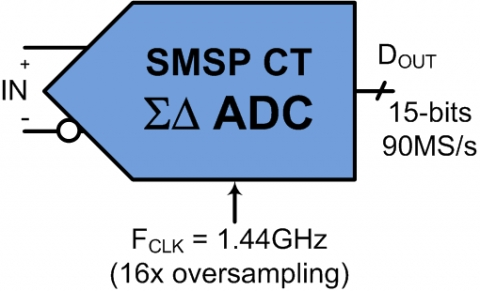 The SM-CTDSM-45M is a 15-bit continuous-time delta-sigma (CTΔΣ) analog-to-digital converter IP. By leveraging Seamless’ patented Switched-Mode Signal Processing (SMSP) technology, our ADC seamlessly fits into system-on-chip integrated circuits requiring only small area and low power. With up to 45MHz input signal bandwidth, 77dB of SNDR, high clock jitter tolerance and a resistive input, SM-CTDSM-45M’s over-sampling architecture is extremely well suited for high-speed transceivers, imaging and LiDAR applications.